Several reports have suggested that HTC is working on developing a smaller version of the HTC One, codenamed the M4 and likely officially named the "HTC One Mini." Yesterday Bloomberg said that the HTC Mini will launch sometime in August, and now Engadget says it has obtained a legitimate shot of the smaller smartphone. As you can see in the shot above, the device is indeed a good deal smaller than the HTC One but appears to maintain some of the features, including the Boom Sound stereo front-facing speakers. 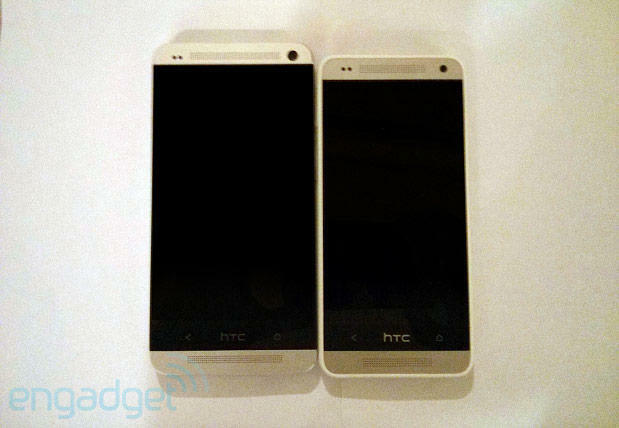 The phone has a 4.3-inch screen that's 0.4-inches smaller than the HTC One display. Engadget said it has learned that the device is also made out of aluminum and that it still features the unibody design. It offers Beats Audio, too, but lacks the IR blaster found on the HTC One. The device reportedly runs Android 4.2.2 Jelly Bean with Sense, though we don't yet know if it's going to run Sense 5 or if it will pack an earlier version as previous leaks have suggested. Engadget said early speed test results indicate a 1.4GHz dual-core processor is likely, but we still don't have any information on the cameras or what sort of storage options will be available. Hopefully we learn more as August approaches.